The Holden Grey motor is often referred to as the Holden side plate. 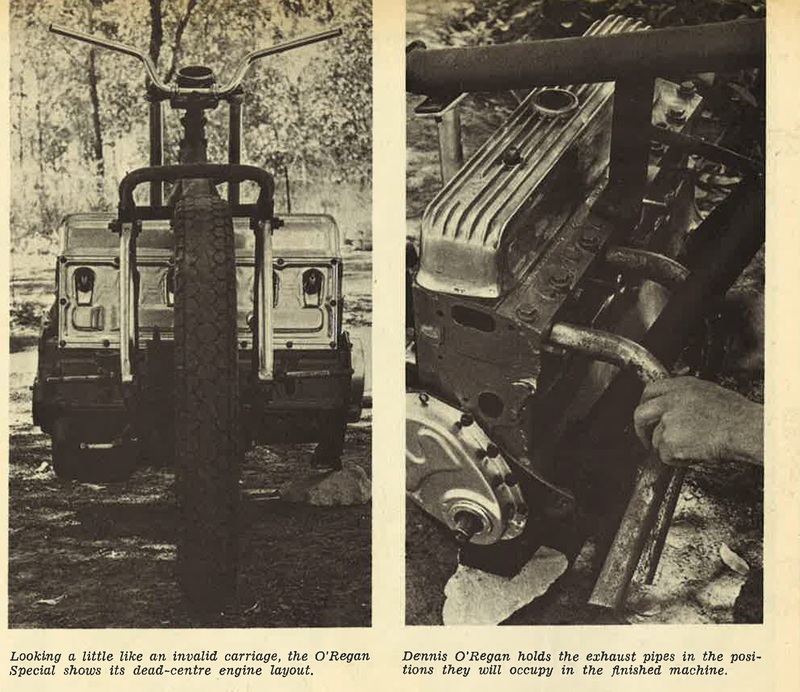 The engine earned its name as they were painted grey from the factory. They came in 2 sizes, 138ci and 132ci. More engineering and after market modifications have gone into this engine than any other engine in Australian automotive history. TAKE a 210 bhp, six-cylinder Holden engine, a supercharger, various lengths of steel tube, a conglomeration of cogs, chains and shafts, an assort-ment of mechanical bits and pieces, throw together methodically, add two wheels — and you've got a motorcycle? You also need another ingredient — the guts to ride it. One hopes Dennis O'Regan takes after his Irish ancestors in that respect, because he's certainly going to need a fair helping of intestinal fortitude when he climbs aboard. Over three recent months Dennis, who lives in the outer Sydney suburb of Kingswood, with the help of his brother and several mates, has been building up an outfit which is guaranteed to warm the blood of every drag fan in Australia. 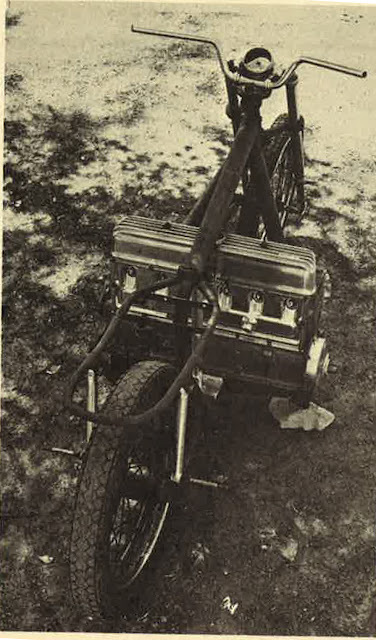 The main difference between this and other drag bikes so far seen on Australian strips is in the power unit — a 1955 Holden six. This has been mounted sideways in a special frame which had its origin a long way back on a Triumph outfit. The only part of the Triumph frame which is left is the rear section which mounts the wheel and will eventually carry the seat. However, even this is due for some extra modification. The front of the frame is all Dennis' own work. It is built of welded steel tube with heavy gauge plate for engine mounts and brackets. The top tube is 21 in. diameter, 11 gauge and the two front engine braces 2 in., 16 gauge. The rest is in 1 in. or 11 in., 11 gauge. The engine itself is built in to form part of the frame. 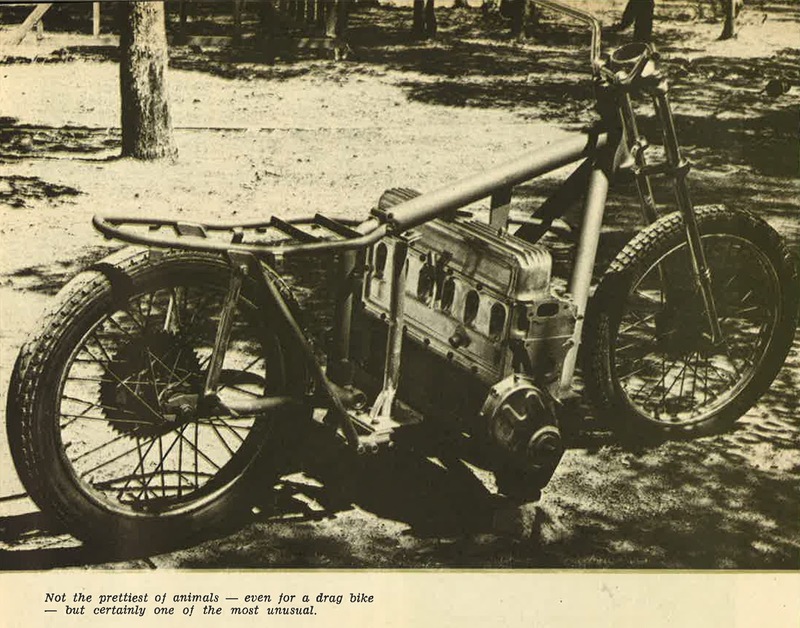 The front forks are from a BSA 125, mounted on an Aerial stem. However, this will be replaced with a stem of Dennis' own making to bring the forks closer together to fit a 20 in. Bultaco front wheel running a 2.75 width tyre. The front wheel will also be fitted with a brake for starting only. The rear wheel is the original 20 in. Triumph, unsprung and will eventually be fitted with a 300 Avon drag slick. Altogether the frame is extremely simple yet designed for maximum strength. In standard form the engine puts out about 65 bhp but when the bike first appears it will probably be producing in the vicinity of .140 bhp. However, the supercharger should easily boost this over the 200 mark with other modifications and careful tuning. At one stage Dennis thought of including a gear-box, possibly an early Morris unit, in place of the transfer shaft, but this posed too many problems and will not be required anyway, as he has dropped plans for using the machine for roadwork. The fuel tank will either be mounted underneath the top frame member in front of the motor or along the top member in the form of another tube. It will have a capacity of about half a gallon. Another engine modification will be the addition of a fabricated sump, angled to the centre for a centre oil pickup and to give better ground clearance at the sides. The electrics will be as for the normal Holden, but both the generator and starter motor will be scrapped. It will also run without a radiator. With an estimated final weight of about 6501b, a possible standing quarter speed of 140 mph at 7500 rpm and time around 10 seconds this is going to be a pretty mobile rig. 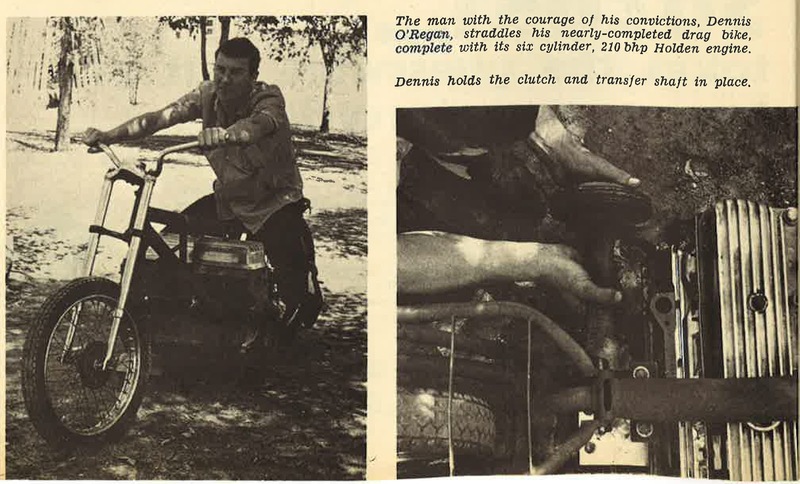 However, Dennis says he won't need a parachute, just a standard back brake — and a good prayer. So far this project has cost him only $50. Final cost will probably be about $400. If you're a drag fan, keep your eyes open for an extra wide, two-wheel monster in brilliant orange. 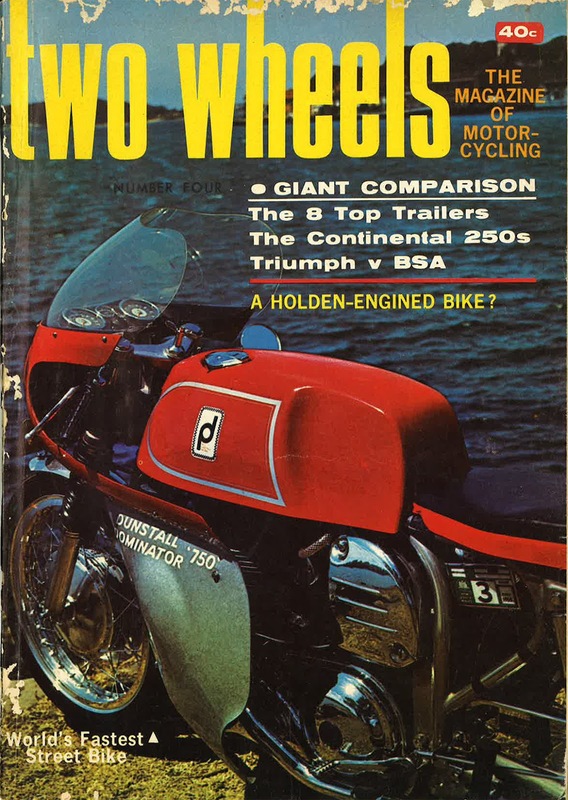 mating of the bike and Holden engine takes place.